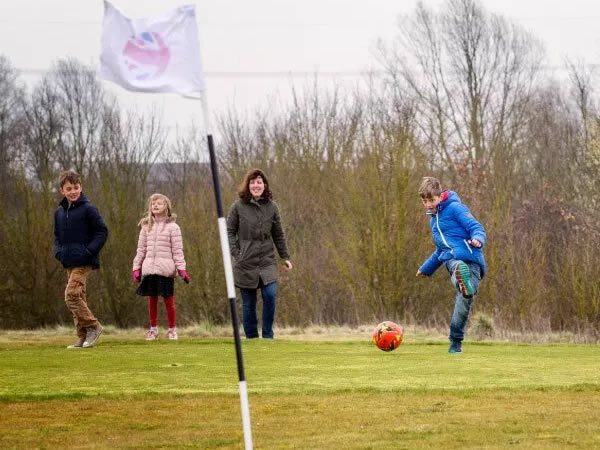 Not far from Bishops Stortford, in Much Hadham, Hertfordshire, is Great Hadham Footgolf, located at the Great Hadham Country Club. Available daily, this course is 1,169 yards with 9 holes and a Par of 35. This is Footgolf course enjoyed on rolling meadow land with many challenging and diverse undulations. Water features are also part of this course, so watch your kick! The Clubhouse is well equipped with a bar, restaurant and café as well as showers and changing facilities. Within the Clubhouse there is also a Health Club with a beauty and well-being centre and several function rooms available to hire. Footballs are available for use for a small deposit. Simply turn up in comfy clothing, with trainers or golf shoes, and you’ll be all set to play.